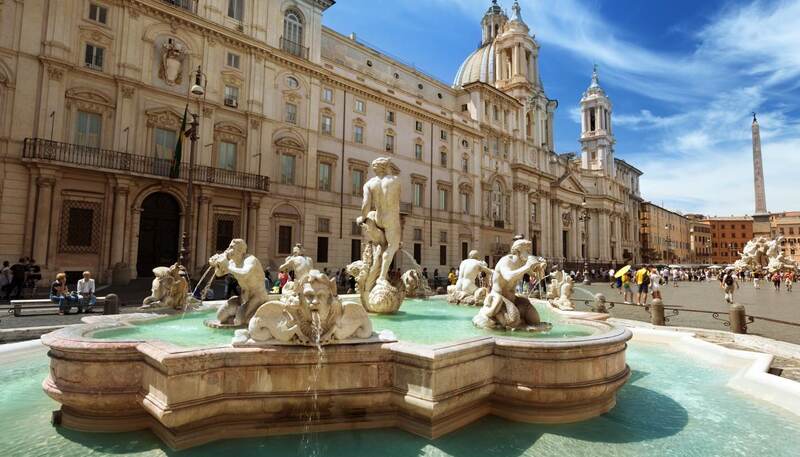 Airlines operating direct flights to Rome from the UK include Alitalia, British Airways, easyJet, Jet2.com, Monarch, Norwegian, Ryanair and Vueling Airlines. With so much competition on the route, cheap flights are available year-round, but you should book ahead if travelling over busy periods such as school holidays or Christmas. American Airlines, Alitalia and Delta offer direct flights from the USA. From London - 2 hours 30 minutes; New York - 8 hours 15 minutes; Los Angeles - 13 hours 30 minutes (including stopover); Toronto - 8 hours 30 minutes; Sydney - 23 hours (including stopover). Most of Rome’s historic centre is closed to non-resident traffic from Monday to Friday 0630 to 1800 and from 1400 to 1800 on Saturday. There are also restrictions in place in parts of Monti, San Lorenzo and Trastevere. If you are staying in this zone, contact your hotel who will be able to arrange permission for you to drive into the restricted zone. 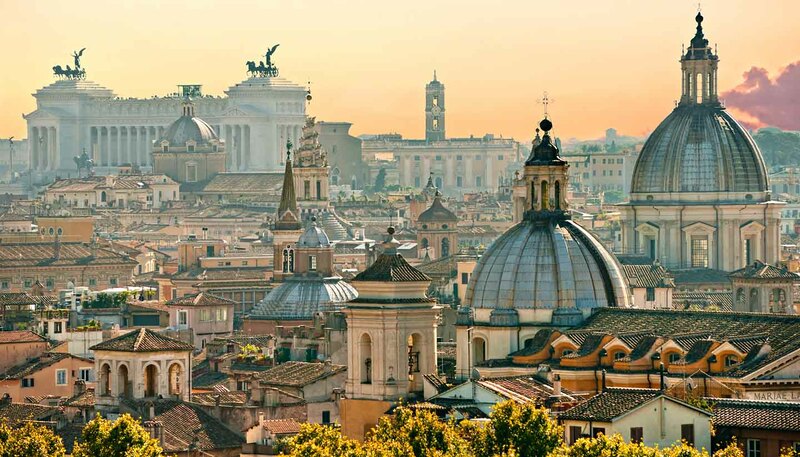 Traffic in Rome drives on the right and the minimum driving age is 18 years. Speed limits are 130kph (80mph) on motorways and 50kph (30mph) in urban areas. UK driving licences and EU pink-format licences are valid in Italy (UK green licences must be accompanied by an International Driving Permit) and a Green Card and motor insurance certificate are strongly recommended. The AA or RAC in Britain and the AAA in America have reciprocal agreements with the Automobile Club d'Italia (ACI) (tel: +39 06 491 115; www.aci.it), which provides a useful advisory service as well as dealing with breakdowns. ACI (tel: +39 803 116). Rome is encircled by a network of motorways. The A12 leads into Rome from the west and the A24 from the east. Ciampino Airport is connected to the city by Via Appia Nuova (SS7). The A1 runs between Rome, Florence and Milan, while to reach Venice, drivers should turn off the A1 at Bologna and take the A13. The regional transport authority Cotral (0800 174 471, in Italy or +39 06 7205 7205; www.cotralspa.it) runs blue coaches throughout the Lazio region. Eurolines (tel: +39 0861 199 1900; www.eurolines.it) runs international coaches, with connections to cities throughout Europe, such as London (via Paris). Journeys are long and slow, but fares are cheap. There is no central coach station in Rome. Coaches depart and terminate in front of Tiburtina railway station, Via Tiburtina (metro stop Tiburtina). From Florence - 3 hours; Milan - 6 hours; Venice - 5 hours 30 minutes; Naples - 2 hours 30 minutes. Rome is well connected by train to the rest of the country. Roma Termini, Piazza Cinquecento, is Rome's hub station for international and long-distance trains. It is also the metro hub and the location of the main bus terminal. Rome’s second train station is Roma Tiburtina. Of the capital's other stations, the most important are Roma Ostiense and Trastevere. You must validate printed tickets in the yellow machines located on the station platforms prior to boarding. All international trains, including direct services to Munich and Vienna, leave from Roma Termini station. Trenitalia (tel: +39 06 6847 5475; www.trenitalia.com) is the national rail company, which runs a fast, efficient and good-value service throughout Italy. Italo (tel: +39 06 8937 1892; www.italotreno.it) offers a high-speed service from Florence, Bologna, Milan and Turin as well as Naples and Salerno. From Naples - 1 hour 10 minutes; Florence - 1 hour 30 minutes; Milan - 2 hours 55 minutes; Venice - 3 hours 45 minutes; Munich - 12 hours; Vienna - 14 hours. The port of Civitavecchia is 80km (50 miles) northwest of Rome and is located at Molo Vespucci, 00053 Civitavecchia (www.civitavecchiaport.org). It is run by the Autorità Portuale di Civitavecchia. There are ferry connections between the port of Civitavecchia and Sicily, Sardinia and Barcelona with Grimaldi Lines (www.grimaldi-lines.com/en). Ferry and hydrofoil services to and from Sardinian ports are run by a number of companies including Tirrenia Navigazione (tel: 892 123, in Italy only;www.tirrenia.it), Moby Lines (tel: 199 303 040, in Italy only; www.moby.it) and Sardinia Ferries (tel: +33 4 9532 9595, in France; www.corsica-ferries.co.uk). Trains from Civitavecchia to Rome run approximately every 30 minutes and the journey lasts about one hour. From Civitavecchia railway station, the port is a short taxi or (free) shuttle ride away.